President Blaise Compaore of Burkina Faso has appointed himself minister of defence following an army mutiny in the west African nation. Mr Compaore revealed the move in a cabinet reshuffle announced on national television. Last week, he ordered bonuses for soldiers, sacked the head of the army and dismissed the government in a bid to reassert his authority. 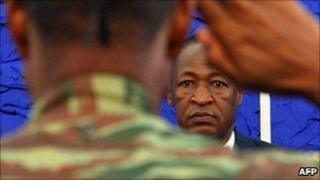 New army chief Gen Honore Nabere Traore said mutineers would meet Mr Compaore. "The crises are heading toward a solution," Gen Traore said on public radio, adding that officials had "found adequate responses" to the mutineers' demands. Trouble began on 14 April when soldiers and presidential guards in the capital Ouagadougou staged a protest over unpaid housing allowances. Tens of thousands of people also took to the streets to demonstrate against high food prices. On Monday, President Compaore also appointed Luc Adolphe Tiao - a journalist without prior government experience - as the country's new prime minister. Mr Compaore is a former soldier who came to power in a military coup in 1987. Landlocked Burkina Faso - formerly Upper Volta - has spent many of its post-independence years under military rule. One of Africa's poorest countries, it has significant reserves of gold, but cotton production is its economic mainstay.